The Limerick Strand Hotel on O'Callaghans Quay, could not be better located for a city break, 2 minutes walk from O’Connell Street (the main shopping street) and all of the other exciting Things there are To Do and See in Limerick city. Like the Hunt Museum, (one of the best in Ireland) King Johns Castle, (one of the oldest) and the Milk Market (one of newest) and much, much more besides. 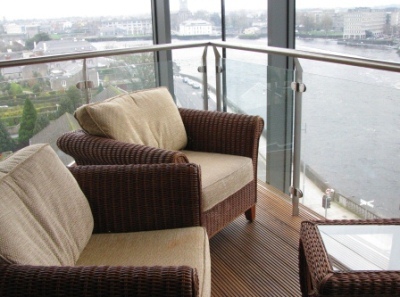 Overlooking the mighty river Shannon, the Limerick Strand Hotel, is the new kid on the block, smart, bright and very good value with rates from €99 per room. Although it is well worth upgrading to a suite (€40 supplement) as they are huge (bigger than most apartments) come with all mod cons of course, huge comfy beds and pristine bathrooms and best of all wrap around glass balconies with deep cushioned wicker armchairs. Perfect for whiling away a lazy afternoon or gazing at the city lights at night. The staff are super friendly and the service instant! No sooner had I checked in, with the lovely Liath at reception, than Damien (see we are on first name terms already) arrived up with a complimentary bottle of champagne and a plate of handmade chocolates! Exactly the sort of pampering tone you expect, but seldom get? And speaking of pampering, be sure to book yourself a treatment in the Asspara Spa located on the ground floor beside the leisure centre with 20mtr pool, sauna, steamroom, jacuzzi and fitness room. Dinner in the River Room is presided over by the ever attentive afore mentioned Damien who is an expert on the provenance of the produce, most of which is source locally. Our prime Irish fillet steaks were perfectly cooked and presented whic we enjoyed with an excellent red wine. Another nice touch were the homemade chocolate chip cookies, we were given to have with a nightcap in our room. Breakfast was hearty and varied and most importantly included in the price. 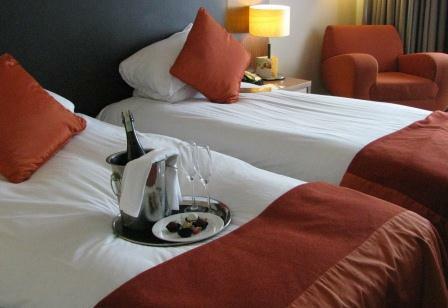 So much of hotel business worldwide, not just in Ireland, has become rationalised and standardised to within an inch of its cost cutting life that the Limerick Strand Hotel was a most welcome and pleasant surprise. The attention to detail, friendliness of the staff and those few little extras that may not have cost a lot but meant everything in terms of a good guest experience. I have no doubt that those ‘favours’ will be returned many times over as recommendations.